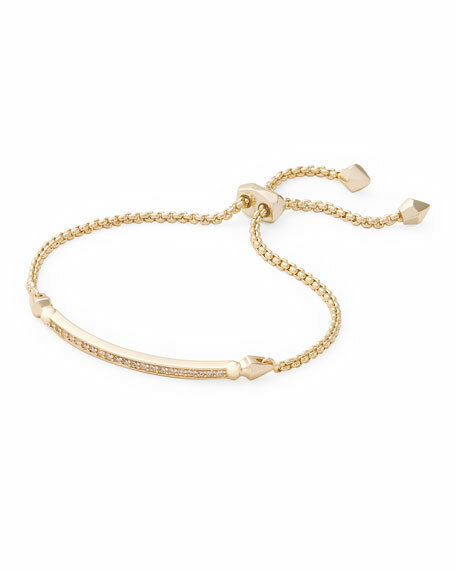 OTT adjustable bracelet by Kendra Scott. White cubic zirconia curved bar. Please note: Due to the one-of-a-kind nature of the medium, exact color patterns may vary slightly from the image shown. The quintessence of the American dream, Kendra Scott launched her eponymous jewelry collection with just $500 and a deep commitment to Family, Fashion & Philanthropy. From humble beginnings in mom-and-pop Austin, Texas shops to a nationwide customer base, the Kendra Scott collection has been lauded for the ability to outfit all types of women with expressive, elegant earrings, necklaces, rings, and bracelets. Already an icon, the colorful Danielle earrings epitomize the Kendra Scott design concept with their vivid hues, playful proportions, and unique shapes. From the Classic Chain Collection. Reversible 18-karat yellow gold and signature sterling silver signature John Hardy woven chain. Push clasp. Sterling silver with woven chain texture. Push-button clasp with 18-karat yellow gold dot texture. Fits medium-size wrists. Handcrafted in Bali.